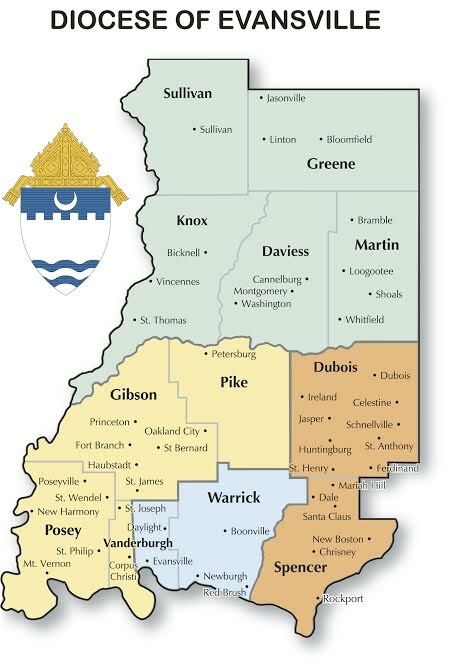 The Evansville Diocesan Catholic Committee on Scouting (DCCS) is a committee affiliated with the Diocese of Evansville Office of Youth and Young Adult Ministry and serving the Buffalo Trace, Hoosier Trails, & Crossroads of America Councils of the Boy Scouts of America (refer to the map below). The Committee is dedicated to promoting “duty to God” at each level of scouting. We are affiliated with the National Catholic Committee on Scouting® (NCCS), an advisory to the Boy Scouts of America, and Region (#7) of the NCCS. Each year the DCCS holds several events to promote Catholic scouting. These events include scout retreats, scouter development, religious emblems counselor training, and a youth and adult religious emblem recognition ceremony. We are able to accomplish these events because of the many dedicated leaders who donate their time and energy to providing quality programs to youth. To find out more about the Committee, the events it sponsors, and the various recognitions that may be obtained, use the NAVIGATION TABS at the top of each page.